While many may associate ravioli as something that comes from a can, drips with tomato sauce and makes a quick lunch on the fly, ravioli is so much more than that. The tiny pillows of pasta are filled with cheeses, meats and herbs and are often boiled before being served under a layer of sauce. 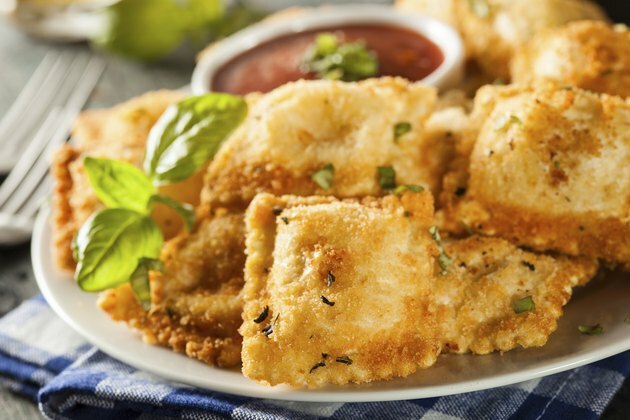 Frying ravioli thickens the outer layer and melts the cheese inside, making for a delectable appetizer or savory snack. For a different twist on an old favorite, fried ravioli is undoubtedly a crowd pleaser. Pour cooking oil into the bottom of a deep frying pan so it is 1 1/2 to 2 inches deep. Place the skillet on the burner and set it to medium. Sort through the ravioli to make sure that none of them are stuck together. Discard any that are damaged as the filling will leak out while frying. Test the temperature of the cooking oil with a kitchen thermometer. The oil needs to be 325 to 350 degrees Fahrenheit before frying the ravioli. Set the ravioli into the hot oil in small batches to avoid overcrowding them in the pan. The oil around the raviolis will bubble if the oil is hot enough. If you don't see bubbles, take the ravioli out and allow the oil to heat longer. Fry the ravioli for about 1 minute. They will float to the top and boast a golden brown color when they are finished. Remove the ravioli from the pan with a metal slotted spoon. If you use tongs, be gentle so as not to damage them. Place the ravioli onto a paper towel-lined plate. Top the ravioli with sea salt, grated cheese or parsley before serving if desired. Serve the fried ravioli with a dipping sauce of your choice such as marinara, ranch or aioli. Store leftovers in the refrigerator for 2 to 3 days. Refrigerate within 2 hours of cooking. The raviolis may lose their crispiness when reheated. Use fresh, uncooked ravioli for frying. If the ravioli is frozen, thaw it in the refrigerator first.